The Environmental Defence meeting focusing on Stop Bill 66 took place on Saturday, January 12th in Ajax at the Roya Banquet Hall at 185 Westney Road South in Ajax. The Environmental Defence meeting location corresponded with the planned trip of a couple of school bus loads of people, as well as other vehicles, gathering outside the Minister of the Environment, Conservation and Parks, MPP Rod Philips office at 3:00 pm, which is also located in Ajax. There appeared to be at least 100 people or more available to rally against Bill 66 outside MPP Rod Philips office at 3:00 pm, and CTV News was seen filming the activities. 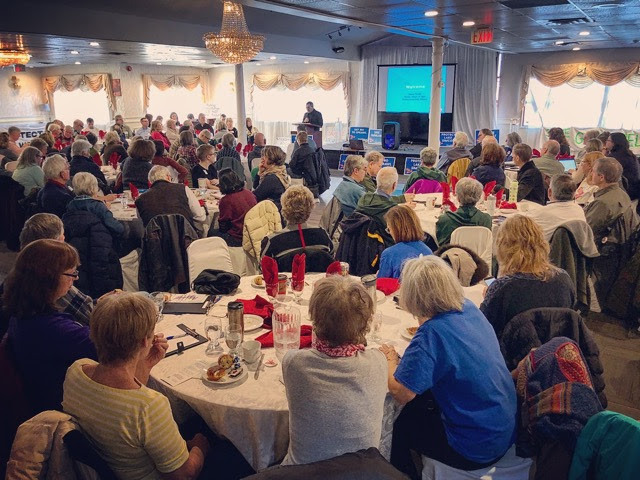 We are not aware of an exact tally of the participants, however a rough estimate based on the number of tables and average number of people per table would suggest that there were likely well over 250 people in attendance. The event was very well organized and offered a rare opportunity to meet, listen to and in some cases share ideas and experiences with a variety of active environmentalists covering a large proportion of Ontario. There appeared to be 4 or 5 pallets of four sets of coroplast signs provided by Environmental Defence, which were distributed to the participants based on how much each person could carry. You may have noticed the Stop Bill 66 signs along the front of our property. We may plan to also place some signs along the portion of the property that faces the Side Road as well. There are extra signs if anyone would like some to place on their property. 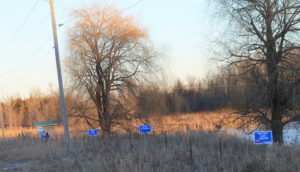 Please keep in mind that the signs would need to be on private property as the Township will likely not be in favour of the signs being located in areas where election campaign signs have generally been installed and accepted. Based on Ramara Township’s past performance, and their demonstrated political leanings, they are also not likely going to be very happy to see or hear of a Stop Bill 66 campaign. This link is to some video recordings from the Environmental Defence meeting focused on Stop Bill 66. The videos primarily include the legal review of Bill 66 from Dr. Anastasia Lintner with the Canadian Environmental Law Association, and a talk on municipal resolutions and how to get your local municipal council onside, by Mayor Rob Burton from the Town of Oakville. Please check out the Environmental Defence website for much greater detail of how Bill 66 threatens our clean drinking water, how the current Ontario government is attacking our environmental laws in Ontario, as well as many other facts and details specific to protecting our environment. Land Over Landings stands shoulder to shoulder with citizens and advocates from across the province, of all political stripes and from all walks of life, to say: #StopBill66. In Ajax, on Jan. 12, hundreds gathered for an in-depth look at the Bill. Environmental Defence and the Canadian Environmental Law Association (CELA) led us through the details. Former Ajax mayor, Steve Parish, was there, as was Oakville’s mayor, Rob Burton. So were we – not just as deeply concerned Ontarians but also because the Federal Lands are partly on the Moraine, are surrounded by the Greenbelt, are partly Greenbelt themselves, and should, by rights, be entirely Greenbelt. This draconian omnibus bill – in particular, Schedule 10 – would, if passed, undermine decades of farmland, water, and environmental protections going back to the government of Bill Davis and through successive Progressive Conservative, Liberal, and NDP governments since. Among the worst aspects of this Bill are sections that abolish advance public notice of changes to Official Plan zoning and to Greenbelt and water protections – with no right of appeal. We urge you to contact your councillors and MPPs with a strong message. And do NOT believe anyone who says this won’t affect the Greenbelt. It will.